When it comes to two-wheeled excursions – particularly mountain biking – nothing is more important than the quality of a rider’s bike as well as his or her satisfaction with it. Mountain bikes are designed with the intent of being used in an off-road fashion on logging roads, dirt trails and other isolated areas. There are a variety of mountain bikes available to those who love the sport, with four different types of suspensions: fully rigid, hard trail, soft tail and dual. In pursuit of genuine, well-balanced women’s mountain bikes, we will be reviewing the Diamondback Lustre One Mountain Bike. Diamondback Bicycles manufacture every type of bike imaginable: from cyclocross to mountain hardtail, they cover the entire spectrum of performance cycling. The Diamondback Lustre One is forged from lightweight aluminum, providing an agile but steady frame on which to fly down steep hills and is specially contoured for women. The brakes are made with aluminum alloy and the Shimano 7-speed shifter allows for quick and precise gear changes whether you are on the trail or in town. The Diamondback Lustre One is one of the better women’s mountain bikes and for a price tag of less than $200 is also a great bargain bike. The Diamondback Lustre One comes in three different frame sizes: 13”, 15” and 17”, allowing any rider to be accommodated. The Shimano shifter allows for smooth shifting which translates into a more efficient riding experience. The aluminum alloy brakes hold up wonderfully even on steep inclines and the bicycle grips keep the rider in place. 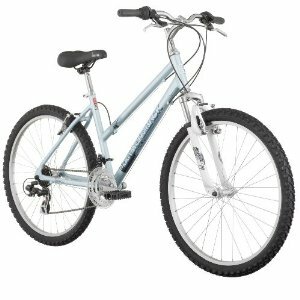 The casual trail rider or commuter will enjoy the flexibility of this bike and the mobility of it when having to carry it; while not an ultra lightweight bicycle, it is one of the most adaptable women’s mountain bikes that is portable enough for most to carry up a flight of stairs. As with any entry-level bicycle, there are some downsides to the product as well. The number one concern is that the seat is not comfortable; on Diamondback’s website, the seat is listed as a men’s seat in the specifications so this may have something to do with the reports. The bike arrives not assembled so you should be prepared for that process, although most who order their bicycles online are aware and accepting of this issue. For those who are seeking a well-rounded bike that can handle both off-road conditions and city cruising, the Diamondback Lustre One Mountain Bike is an excellent pick. When compared to all other women’s mountain bikes, the Lustre One holds its own due to a combination of performance versus price. You will be hard-pressed to find a better hybrid mountain bike on the market for less than the cost of the Diamondback Lustre One. This entry was posted in Bikes, Diamondback, Mountain Biking, Reviews and tagged Diamondback, Mountain Bike. Bookmark the permalink.